Those who think of other planes at all consider them remote, distant realms, but planar influence can be felt throughout the world. It sometimes manifests in beings who, through an accident of birth, carry the power of the planes in their blood. The genasi are one such people, the offspring of genies and mortals. The Elemental Planes are often inhospitable to natives of the Material Plane: crushing earth, searing flames, boundless skies, and endless seas make visiting these places dangerous for even a short time. The powerful genies, however, don’t face such troubles when venturing into the mortal world. They adapt well to the mingled elements of the Material Plane, and they sometimes visit—whether of their own volition or compelled by magic. Some genies can adopt mortal guise and travel incognito. During these visits, a mortal might catch a genie’s eye. Friendship forms, romance blooms, and sometimes children result. These children are genasi: individuals with ties to two worlds, yet belonging to neither. Some genasi are born of mortal–genie unions, others have two genasi as parents, and a rare few have a genie further up their family tree, manifesting an elemental heritage that’s lain dormant for generations. Occasionally, genasi result from exposure to a surge of elemental power, through phenomena such as an eruption from the Inner Planes or a planar convergence. Elemental energy saturates any creatures in the area and might alter their nature enough that their offspring with other mortals are born as genasi. Genasi inherit something from both sides of their dual nature. They resemble humans but have unusual skin color (red, green, blue, or gray), and there is something odd about them. The elemental blood flowing through their veins manifests differently in each genasi, often as magical power. Seen in silhouette, a genasi can usually pass for human. Those of earth or water descent tend to be heavier, while those of air or fire tend to be lighter. A given genasi might have some features reminiscent of the mortal parent (pointed ears from an elf, a stockier frame and thick hair from a dwarf, small hands and feet from a halfling, exceedingly large eyes from a gnome, and so on). Genasi almost never have contact with their elemental parents. Genies seldom have interest in their mortal offspring, seeing them as accidents. Many feel nothing for their genasi children at all. Some genasi live as outcasts, driven into exile for their unsettling appearance and strange magic, or assuming leadership of savage humanoids and weird cults in untamed lands. Others gain positions of great influence, especially where elemental beings are revered. A few genasi leave the Material Plane to find refuge in the households of their genie parents. Genasi rarely lack confidence, seeing themselves as equal to almost any challenge in their path. This certainty might manifest as graceful self-assurance in one genasi and as arrogance in another. Such self- confidence can sometimes blind genasi to risk, and their great plans often get them and others into trouble. Too much failure can chip away at even a genasi’s sense of self, so they constantly push themselves to improve, honing their talents and perfecting their craft. As rare beings, genasi might go their entire lives without encountering another one of their kind. There are no great genasi cities or empires. Genasi seldom have communities of their own and typically adopt the cultures and societies into which they are born. The more strange their appearance, the harder time they have. Many genasi lose themselves in teeming cities, where their distinctiveness hardly raises an eyebrow in places accustomed to a variety of different people. Although any world that includes one or more elemental planes can feature genasi, on Athas, the world of the Dark Sun campaign setting, elemental forces hold greater sway than they do on other worlds. As a people touched by elemental power, genasi are viewed as seers, prophets, and chosen ones. The birth of a genasi, whether a slave, a noble, or a member of a desert tribe, is an auspicious event. Most Athasians believe a given genasi is destined for greatness—or infamy. Those living on the frontier, though, have a much harder time. People there tend to be less accepting of differences. Sometimes a cold shoulder and a suspicious glare are the best genasi can hope for; in more backward places, they face ostracism and even violence from people who mistake them for fiends. Facing a hard life, these genasi seek isolation in the wilds, making their homes in mountains or forests, near lakes, or underground. Most air and fire genasi in the Realms are descendants of the djinn and efreet who once ruled Calimshan. When those rulers were overthrown, their planetouched children were scattered. Over thousands of years, the bloodlines of those genasi have spread into other lands. Though far from common, air and fire genasi are more likely to be found in the western regions of Faerûn, along the coast from Calimshan north up to the Sword Coast, and into the Western Heartlands to the east. Some remain in their ancient homeland. In contrast, water and earth genasi have no common history. Individuals have difficulty tracing their own lineage, and bloodlines occasionally skip a generation or two. Many earth genasi originated in the North and spread out from there. Water genasi come from coastal areas, the largest concentration of them hailing from the regions surrounding the Sea of Fallen Stars. The distant land of Zakhara is known only in legends to most inhabitants of Faerûn. There, genies and spellcasters enter into bargains, and genasi can result from such pacts. Those genasi have been sources of great weal and woe in the history of that land. Each genasi subrace has its own temperament, which might make some backgrounds more suitable than others. Air genasi are proud of their heritage, sometimes to the point of haughtiness. They can be flamboyant, and are keen to have an audience. They rarely stay in one place for long, always looking for a new sky to see and breathe. Air genasi who don’t live in cities favor open lands such as plains, deserts, and high mountains. Fitting backgrounds include charlatan, entertainer, and noble. Earth genasi are more withdrawn, and their connection to the earth keeps them from being comfortable in most cities. Their uncommon size and strength makes them natural soldiers, though, and with their stoic demeanor, they can encourage others and become great leaders. Many earth genasi live underground, where they can be in their favored element. When they emerge from their caves, they might roam the hills and mountains or lay claim to old ruins. Appropriate backgrounds for earth genasi include hermit, outlander, and soldier. Fire genasi often get themselves into difficulty with their fiery tempers. Like their air genasi cousins, they sometimes flaunt their perceived superiority over common folk. But they also want others to share their high opinion of themselves, so they constantly seek to enhance their reputations. Likely backgrounds for a fire genasi include criminal, folk hero, and noble. Water genasi almost all have some experience aboard or around sea vessels. They make excellent mariners and fishers. Like earth genasi, though, water genasi prefer quiet and solitude; the wide shores are their natural homes. They go where they want, do what they want, and rarely feel bound to anything. Good backgrounds for water genasi include hermit and sailor. Genasi use the naming conventions of the people among whom they were raised. They might later assume distinctive names to capture their heritage, such as Flame, Ember, Wave, or Onyx. Four major subraces of genasi are found among the worlds of D&D: air genasi, earth genasi, fire genasi, and water genasi. Choose one of these subraces. Your genasi character has certain characteristics in common with all other genasi. You can speak, read, and write Common and Primordial. Primordial is a guttural language, filled with harsh syllables and hard consonants. Genasi mature at about the same rate as humans and reach adulthood in their late teens. They live somewhat longer than humans do, up to 120 years. Independent and self-reliant, genasi tend toward a neutral alignment. Genasi are as varied as their mortal parents but are generally built like humans, standing anywhere from 5 feet to over 6 feet tall. Your size is Medium. As an air genasi, you are descended from the djinn. As changeable as the weather, your moods shift from calm to wild and violent with little warning, but these storms rarely last long. Air genasi typically have light blue skin, hair, and eyes. A faint but constant breeze accompanies them, tousling the hair and stirring the clothing. Some air genasi speak with breathy voices, marked by a faint echo. A few display odd patterns in their flesh or grow crystals from their scalps. You can hold your breath indefinitely while you’re not incapacitated. You can cast the levitate spell once with this trait, requiring no material components, and you regain the ability to cast it this way when you finish a long rest. Constitution is your spellcasting ability for this spell. As an earth genasi, you are descended from the cruel and greedy dao, though you aren’t necessarily evil. You have inherited some measure of control over earth, reveling in superior strength and solid power. You tend to avoid rash decisions, pausing long enough to consider your options before taking action. Elemental earth manifests differently from one individual to the next. Some earth genasi always have bits of dust falling from their bodies and mud clinging to their clothes, never getting clean no matter how often they bathe. Others are as shiny and polished as gemstones, with skin tones of deep brown or black, eyes sparkling like agates. Earth genasi can also have smooth metallic flesh, dull iron skin spotted with rust, a pebbled and rough hide, or even a coating of tiny embedded crystals. The most arresting have fissures in their flesh, from which faint light shines. Your Strength score increases by 1. You can move across difficult terrain made of earth or stone without expending extra movement. You can cast the pass without trace spell once with this trait, requiring no material components, and you regain the ability to cast it this way when you finish a long rest. Constitution is your spellcasting ability for this spell. As a fire genasi, you have inherited the volatile mood and keen mind of the efreet. You tend toward impatience and making snap judgments. Rather than hide your distinctive appearance, you exult in it. 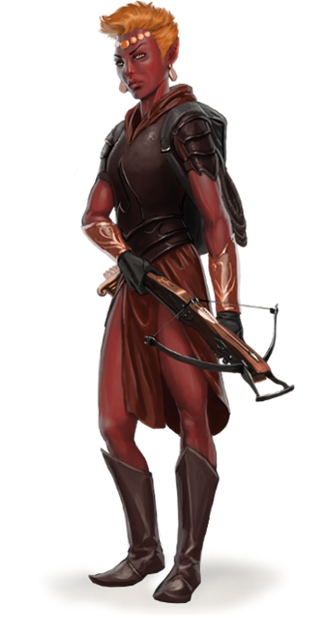 Nearly all fire genasi are feverishly hot as if burning inside, an impression reinforced by flaming red, coal- black, or ash-gray skin tones. The more human-looking have fiery red hair that writhes under extreme emotion, while more exotic specimens sport actual flames dancing on their heads. Fire genasi voices might sound like crackling flames, and their eyes flare when angered. Some are accompanied by the faint scent of brimstone. You can see in dim light within 60 feet of you as if it were bright light, and in darkness as if it were dim light. Your ties to the Elemental Plane of Fire make your darkvision unusual: everything you see in darkness is in a shade of red. You know the produce flame cantrip. Once you reach 3rd level, you can cast the burning hands spell once with this trait as a 1st-level spell, and you regain the ability to cast it this way when you finish a long rest. Constitution is your spellcasting ability for these spells. The lapping of waves, the spray of sea foam on the wind, the ocean depths—all of these things call to your heart. You wander freely and take pride in your independence, though others might consider you selfish. Most water genasi look as if they just finished bathing, with beads of moisture collecting on their skin and hair. They smell of fresh rain and clean water. Blue or green skin is common, and most have somewhat overlarge eyes, blue-black in color. A water genasi’s hair might float freely, swaying and waving as if underwater. Some have voices with undertones reminiscent of whale song or trickling streams. You can breathe air and water. You have a swimming speed of 30 feet. You know the shape water cantrip. When you reach 3rd level, you can cast the create or destroy water spell as a 2nd-level spell once with this trait, and you regain the ability to cast it this way when you finish a long rest. Constitution is your spellcasting ability for these spells. eh...not the most exiting race to play as...you can just play them as normal humans in most situations. Plus. there are other races that fill individual roles, like hafling's being small brave adventures and the gnome being inventive and sometimes reclusive tinkers. Elves see them selves as perfect examples of high society and Lizard folk see them selves as the master race. the Genasi really have no culture or life breathed into there existence other than there related to a genie and get cocky. I think the Air Genasi is an interesting idea for roleplay.... but the character is underwhelming and underpowered when compared to similar races. My plan is to allow the Air Genasi to use some talent from her "mortal" parent/half... Should be comparable to Half-Elves in that respect. "A given genasi might have some features reminiscent of the mortal parent (pointed ears from an elf, a stockier frame and thick hair from a dwarf, small hands and feet from a halfling, exceedingly large eyes from a gnome, and so on)"
Just a simple addition.... example: Darkvision for an Elf/Air Genasi could go a long way to help bring that character up to par with their companions. You have to create the character yourself. Therefore you create your character's culture and life. I play in a game where I'm an air Genasi Rogue and a friend plays as my brother who is a water Genasi Druid. Our backstory is that we are orphans who raised ourselves on the streets of a mafia style town. The Genasi abilities proved very useful in this style of game. I being able to hold my breath indefinitely, and he breathing under water, allowed us to sneak into a mafia base through a river. Then we were able to sneak past sooooo many traps I just levitated over them and he disarmed some freezing them with his shape water and freezing the mechanisms. We ended up breaking that game by assassinating a major character mob boss LOL. So it all just depends on how you play the character! That's now one of my favorite campaigns and it taught me to love Genasi. LOL...it was originally a spur of the moment game but we ended up playing it out further so we didnt work out all the details, but since we are orphans that could make sense HAHA..or our parents could simply be a water Genasi and an air Genasi. I like the Genasi as a race because there is no really race background that allows my mind go to work and I can do anything I want with them. I have been playing and DMing 27 years now and I love the plane settings. Plane touched like the Genasi are fun to play all one has to do is open up ones mind and see were you can take your character with in the rules your DM sets for their game. Do they have dark vision at all? For any of the elements? Do you need to be a spell caster to use the subclass spells? I guess it could function well for people who are only used to playing as human characters, and want to sorta dip their toes into trying something a bit different, but not too different. Your brother? Well the parent genasi must both be different so does that mean your humanoid parent goes around banging different genies?
" a rare few have a genie further up their family tree, manifesting an elemental heritage that’s lain dormant for generations." Their mother need not have slept with a genie at all. Whenever I want to play a fire Genasi, I always look to Hades from Hercules as inspiration for their personality. Always trying to play it cool, even affable at times, but has a very short fuse and can burst into smoke and flame at any moment. I actually love this race as a roleplaying option. Each of the variants can play to a specific attitude. Earth Genasi as Stubborn, Fire is Rash/Passionate, Water can be caring or uncaring or switches between, and Air can be played as free-spirited and air-headed. Obviously, it doesn't limit the way you roleplay, you can play any character however you want. But these make good intro characters for people who have perhaps never played before because they can focus on a specific trait and expand from there. The other thought I had was for a campaign that is Elemental heavy (such as the Elemental Evils campaign). If I have 4 players, they can each play a different Genasi variant. This could affect their relationships in ways. Fire and Water don't get along, arguing for the sake of arguing. Earth could be stoic and Air is constantly trying to get them to laugh and smile but is just annoying them. When Fire gets mad, Air hides behind sturdy Earth before Water comes by to calm them down. When Air gets sad, Earth gives the best hugs. Air and Water both enjoy conversing with the other, talking about traveling and gardening. Comparing bucket lists. Fire and Earth are hardworking companions, you can find them in the kitchen; teaching each other new recipes. Or building something. Learning by doing.